With contributions by Joanna Apap, Laura Bruzzaniti, Richard Delpierre, Philippe De Bruycker, Pietro Emili, Antoine Fobe, Marc Goodacre, Sören Haar and Fabrice Van Michel. Of the "four freedoms of movement" embraced in the single European market concept--capital, goods, services, and persons-- the last-mentioned lags far behind in the practical affairs of Member States. In fact, the restrictions on free movement of persons are among the most significant failures of European integration. 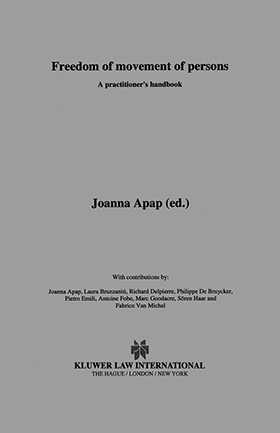 This invaluable practice guide will help practitioners to interpret and apply appropriate legislation, directives, regulations, and policy statements to remedy such situations as the following: transfer of unemployment benefits; timely recognition of qualification for employment; transfer of retirement benefits; age limits defining dependents; restrictions on family reunion rights; rights of third country nationals married to EU nationals; and persons dependent on social assistance. In addition to this detailed practical material, Freedom of Movement of Persons is the first book to collect the relevant directives, regulations, court judgements, and policy statements dealing with the free movement of persons in the European Union. Between its covers it contains legal analysis, practical guidance, and thorough documentation, making it an essential work for practitioners in the field.